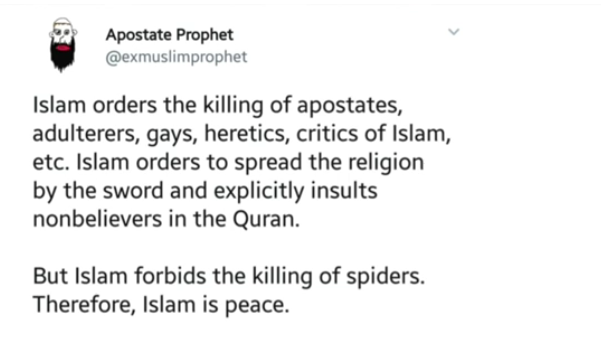 And if you dare to disagree, as one ex-Muslim (@ApostateProphet) on Twitter did, you will get banned. Twitter, Fakebook, all these Muslum controlled, leftist social platforms make me sick. Don’t know the solution to the problem. Apostate Prophet is an intelligent ex-Muslim whose videos on youtube are well worth viewing. Thanks for giving him a plug. Six, I’ve posted a few before and will continue to do so. God bless and protect the courageous apostates from Islam! Linda, Muslim apostates really are an unappreciated/ignored minority in the West, despite them having constant death threats on their lives.